The main reason for seeing this movie can be blamed on my girl crush. Yes, I have a girl crush on Paula Patton. I met her husband Robin Thicke a couple of years ago (he's such a hottie btw), and some day I must meet her too. On to the movie. Everyone and everything was awesome. Crazy Tom Cruise was reminiscent of his first portrayal of Ethan Hunt many moons ago. Jeremy Renner, Simon Pegg and that "who wants to be a millionaire" guy were all wonderful at both the action scenes and the acting scenes. I was pleasantly surprised if you couldn't tell by all my kvelling. The girl from Midnight in Paris is in it as well. And let's not even start on Cruise running down the side of the Burj Khalifa building in Dubai. This is one of those movies on my list that I was going to see mainly because I enjoy the bromance between the main characters played by Robert Downey Jr. and Jude Law. I was also fascinated by it because Noomi Rapace portrayed the female lead. More on Noomi in my other review in this post. A Game of Shadows was pretty funny with a lot of great disguises that made you laugh even more. But it didn't wow me in any way. The plot was interesting, but not really that intriguing. The acting was wonderful, of course, but sometimes I felt like so much was going on in the movie that it was hard to keep up. There are a few super clever moments, especially at the end, that will make you rate this movie higher than it probably deserves. I must preface this review by saying that I have read the entire Lisbeth Salander series, and I even saw all the original Swedish movies. With that said, I still really enjoyed this American version. I don't know if anyone can play Lisbeth the way Noomi Rapace played the role, but Rooney Mara did very well. It's amazing how different she looked as Lisbeth compared to her natural self and her role in The Social Network. Daniel Craig was pretty good and the American remake actually gave me more hope for the vision of this new series. If you've read the books or have even seen the original movies (or both) then you won't be disappointed by this remake. It sticks closely to the books (including the scene that probably gave it an R rating), which is always great. Have you seen or plan to see any of these? Let me know your thoughts! I didnt know that Noomi played Lisbeth in the Swedish version of the Dragon movies, I really loved her in Sherlock Holmes. Wasnt the ending of that clever!! :) I hope you had a great holiday...Jealous that you met Robin Thicke, him and Paula make one hot couple...Im sure their babies are beautiful!! im so watching Sherlock Holmes2!! woot! MI4 is definitely on my watch list. love Jeremy Renner :) Great review. I definitely wondered what the Girl with the Dragon Tattoo was like compared to the original movie, which I saw & I'm glad you wrote about that. Sounds like a great movie! Hey Cheryl! I saw Mission Impossible! I loved it too. Tom Cruise was wicked on the outside of that building. I was getting nauseous in my seat! hahahahaha I love Paula too, but I love Thandie even more so in 2. That green dress Paula wore was fierce. I haven't seen the other two yet,but I really appreciate the reviews. I'll be knocking down Target's doors also. LOL Have a great evening. great reviews & Happy New Year 2012! I've noticed that in EVERY spy movie the women are always dressed to the nines! I've yet to see a Bond Girl in a gown that I didn't like! Might have to see MI4! i so love The Girl With the Dragon Tattoo, the story is really great,. Thanks for the reviews Cheryl! I'd love to see the swedish & American version of the movies. Oh and Paula Patton/Robin Thicke are a ridiculously good looking couple. i think i've determined i'm going to rent sherlock holmes. but i did like the first one. now i gotta check out M.I! I was surprisingly pleased by the Dragoon Tattoo film. I had read the book and seen the Swedish version, too, and I was not disappointed. My only criticism (coming from others I saw the movie with) is that it was hard to follow if you haven't read the book. Point taken: you should always read the book first! 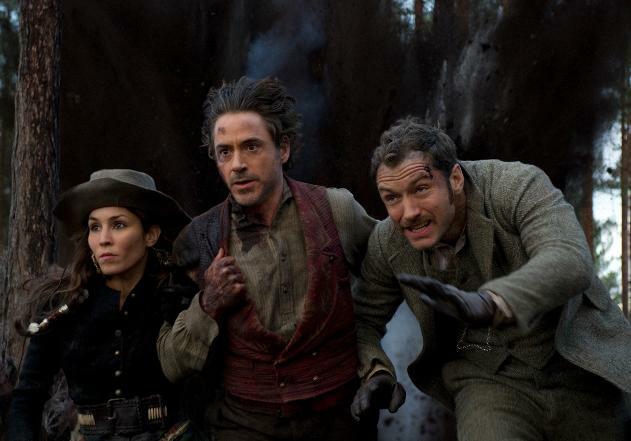 i really want to see sherlock holmes! i just love robert downey jr's acting. I'd like to see the American version of the Girl with the Dragon Tattoo, although I'm considering reading it first... it's out here at the end of Jan so I have a bit of time to plough through the book! Would like to see Sherlock Holmes 2 as well... first one I found hard to keep up with as well, had to see it a few times before everything *clicked*. Awesome movie reviews! I want to see the first two for sure! I happened to have seen all of these films and loved "Girl with the Dragon Tattoo" the most. Rooney Mara is just gorgeous and played her role through to perfection. I've become sort of an emo head since watching the flick, a part of my that has always been there but she's definitely breathed new life into it! i actually really enjoyed mission impossible! i thought it was the ebst of the franchise! Great review, I loved Sherlock Holmes so much... I have seen all of these except The Girl w/ the dragon Tattoo, because I am a bit skeptical. I want to see the girls with the dragon tattoo...looks so good! As usual, I like your movie reviews! I enjoyed Mission Impossible IV but really couldn't get into the plot of Sherlock Holmes. I haven't seen the Girl with a Dragon Tattoo, but may see it when it comes on DVD since I did read the book. I really liked Girl With the Dragon Tattoo although I haven't read the books yet so I was ill prepared for the R rated scenes :x But loved Rooney Mara's makeover! Great movie round up! I enjoyed "Ghost Protocol." Jeremy Renner was great and I really loved Paula Patton in the film. I have yet to see the other two. I have incredibly high expectations for "Dragon Tattoo" and am almot finished with the series (which is why I am waiting to see it). PS: Don't forget to enter HTZYF's $100 Giveaway in honor of the 100th post!